Photo books are an incredible way to preserve your favorite photographs and cherished memories. But so often we find ourselves overwhelmed by even the prospect of figuring out how to even begin, and thus we never get around to making or printing our pictures. This post will walk you through some easy, concrete steps that you can take to create amazing photo books in a limited time and with less stress. Celebration-based photo book: make a photo book focused around your big holidays and events: think birthdays, Halloween, Christmas, first days of school etc. If this is your first time attempting a photo book, I recommend starting with as discrete a focus as possible. Making a baby book for grandma of the first three months or putting together a book focused on your recent two-week trip are much easier to manage, initially, than a larger project covering a longer time span. Now that you have a plan, it is time to gather your photographs. Do not, I repeat, do not simply upload all of the photographs that you have that fit your theme and think that you will pick out the best as you go along. You will wind up wading through pages and pages of tiny, thumbnail-sized images to find the right one, and you will end up easily frustrated. Create an easy-to-remember tag to do your initial sort (Germanytrip or Celebrations or First3Months or similar). 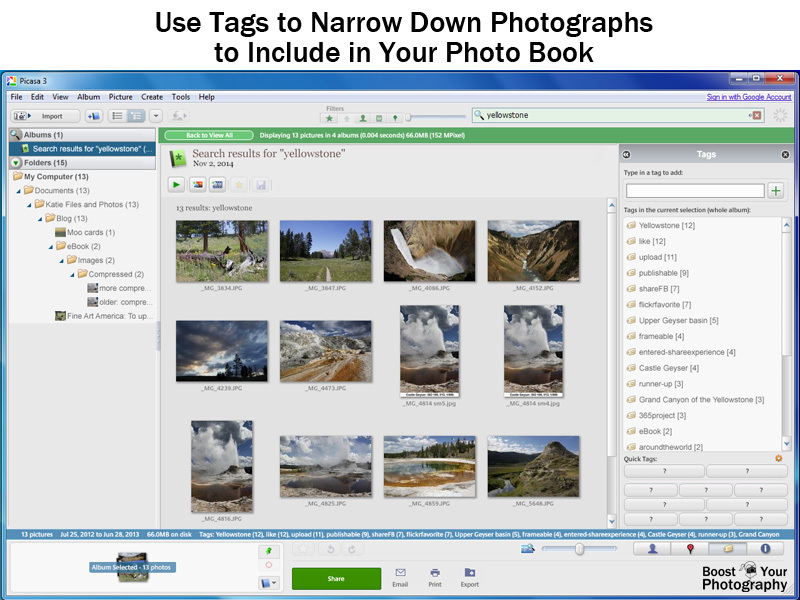 As you sort through your photographs, add the tag to any pictures that you might want to include. You can worry about being picky later. Once you have done this rough sort and identified the pictures that you are going to focus on, now you can do a simple sort by that tag and see all possible images at once. If you are already feeling overwhelmed, try this simple trick that I learned from Gretchen Rubin: suffer for fifteen minutes. Really. Set a 15 minute timer, sit down with your photographs, and start tagging. When the 15 minutes is over, stop. Try it ever day for a week, and you may find that your mountain of unlabeled and unidentified pictures has shrunk considerably. Once you have your potential photographs identified, you have reached the cull stage. Now is the time to get rid of all the duds, duplicates, and dislikes among the images that you have targeted. Some people prefer to use the built-in five-star rating system, or you can simply delete your tag from any photographs that do not make the cut. Now that you can easily search by the tag and see all your photographs in one place, it becomes easier to be picky. Sure, you may have seen seven amazing sunsets from your balcony, but how many different shots do you really need to include to capture that memory? Be critical. If you are feeling nervous about eliminating so many shots, create a backup tag and tag your runner ups in case you decide you need them later. Now you are ready to step into design territory. If you have not previously designed and printed photo books, then you first need to decide which company to use. Read Where to Order Holiday Photography Gifts for my review of three such companies, but there are many others. Ask a few friends, read a few reviews, and then decide. Because the important part is to move forward. Once you have decided, it is time to upload your photographs. 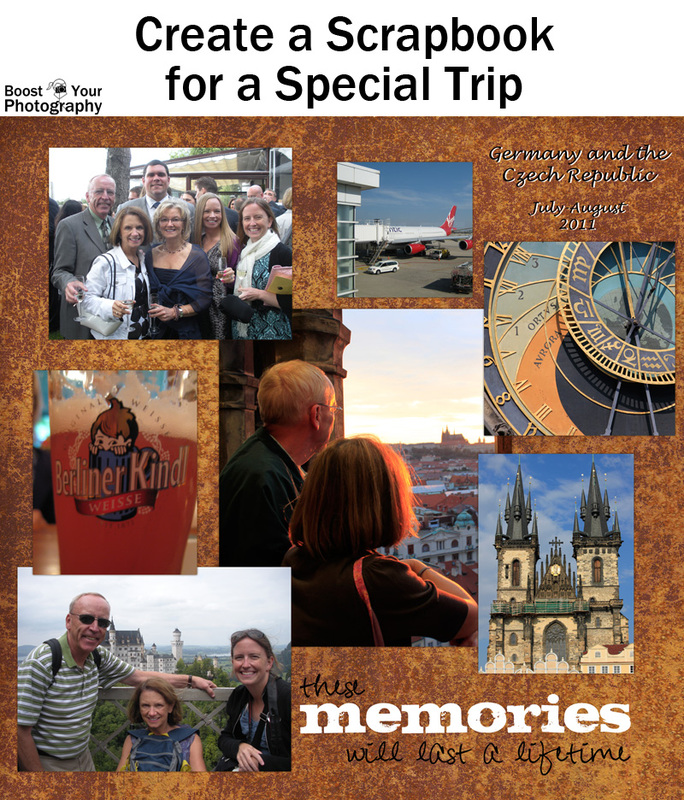 Consider whether your photo book will have discrete sections (such as separate holidays or individual months). If so, consider uploading the photographs for each section as a separate folder. This way, you will only be working with one folder at a time, which makes finding the photograph that you want simpler. Again, think of this as a work-in-progress and not a one day event. Try the 15-minute timer trick again if you need to. You can always save your progress and come back. Take it step-by-step, get a few pages under your belt, and you'll start to realize that you can do this. Final tip: once you have your photo book finished, you may want to take a step back and wait to print. Photo books are constantly going on sale (especially now, approaching the holidays). If you have the patience to wait it out a week or two, you might find that you can order your book at 30 or 40 or even 50% off or more! Large photo books with many pages can become a pricey investment, so a little wait can result in big savings.